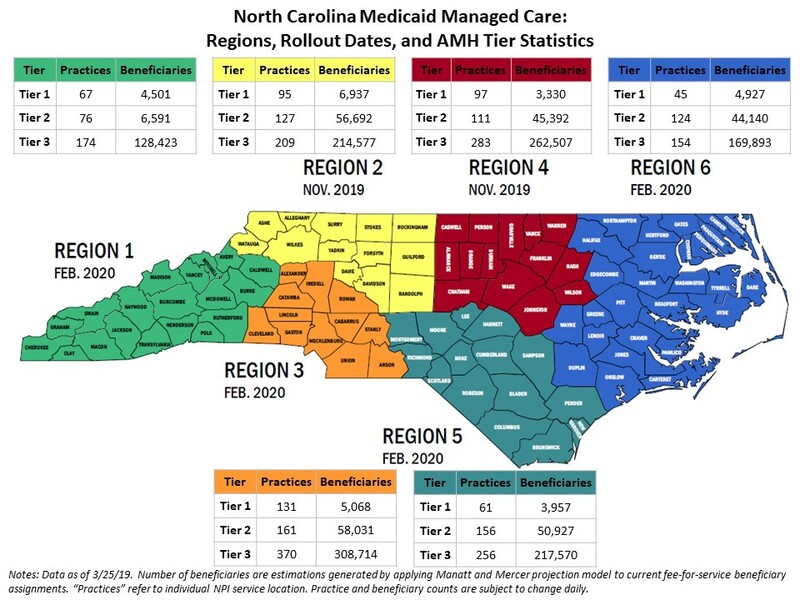 The North Carolina Department of Health and Human Services (DHHS) developed the Advanced Medical Home (AMH) program as the primary vehicle for delivering care management as the state transitions to Medicaid managed care. The AMH program builds on the Carolina ACCESS program. The AMH program requires prepaid health plans (PHPs) to delegate certain care management functions to AMHs at the local level. In order to provide these care management functions, AMHs may work with their affiliated health care system or make an arrangement, with an entity called a Clinically Integrated Network, a Care Management vendor or other population health entity. To ensure that beneficiaries across the state are receiving high quality care management, DHHS developed standards for AMHs and will be responsible for initially certifying that practices meet AMH criteria. As of March 25, 2019, nearly 2,800 individual practices across the state are certified to participate as AMHs, and nearly 1,500 have certified to participate in AMH Tier 3 since the certification process began in October, 2018. These practices range from large health systems to small independent practices. The graphic below gives the footprint of the AMH program across the state (click on the image to see a larger version). Practices interested in participating as an AMH can review or update their AMH tier status by logging into NCTracks (accessing AMH information through NCTracks). By completing an attestation through NCTracks, practices can choose to be a Tier 2 or 3 AMH, and once certified, begin contracting with PHPs. No training is currently scheduled, please check back regularly for updates. Previous training is available on the AMH Training Page.